A venerable tree in Heisler Park, whose low-lying, twisted limbs entice climbers and photographers alike, gained heritage status in October thanks to an appeal by a member of the Beautification Council. 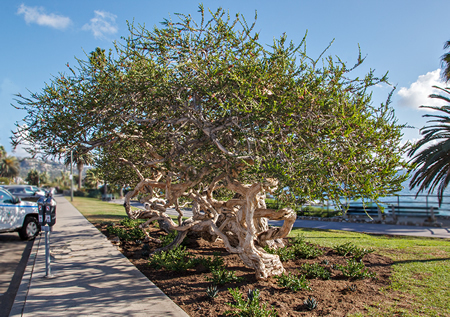 An unusual Heisler Park tree receives special status. The City Council approved the designation for the pink Melaleuca, which means it cannot be removed without cause. Members of the Beautification Council pressed for heritage status as a means to preserve and protect the 60-year-old specimen, said two-year council member Leah Vasquez. “It’s too delicate,” she said, recalling that her now 48-year-old daughter dangled from its limbs as a girl. “It can’t take bouncing or trouncing,” she said. To discourage tree climbers, an understory of thorny natal plum now grows beneath its sprawling limbs and pink pom-pom flowers. “It’s intended as a deterrent, so you won’t be tempted to climb in it,” said Vasquez, who with other council members push for beautifying public spaces and issue annual awards for improvements to commercial and residential property. Arborist Craig de Pfyffer, who oversees trimming in Heisler Park, inspected the tree in question in June and found it in good health, says a staff report. Small children clambering over it and subjects sitting on its limbs for photos are “generally not harmful,” he said in the report. Nevertheless, the Beautification Council is working on devising a suggested sign to discourage tree climbers and a proposed bench from which to appreciate the living sculpture, Vasquez said. City code requires owners of heritage trees, those of 50 or more years old and of a distinctive form, to maintain them while not allowing them to impact neighboring properties. Heisler Park landscaping is trimmed every four years, the report says. Heisler Park was part of the 1906 subdivision known as Laguna Cliffs and was developed by Howard Heisler, L.C. McKnight and the Thumb Brothers, according to Laguna Beach Historical Society member Gene Felder’s blog. Lots along the coast bluff top covering 18.5 acres became Heisler Park, which included planted areas, meandering paths, view points, gazebos and accessways to the ocean. By 1929, Heisler had second thoughts about not developing the prime coastal strand and decided to renege on his offer to dedicate the land for a park, Felder’s blog says. Entrepreneur Elmer Jahraus, whose descendants still occupy a Cliff Drive home opposite the park, felt the decision to develop the land was wrong and filed suit, the blog says. He won and the land has since become one of the town’s most popular public spaces.